This is the third in a 3-part series of articles on the Tongva people by Cindy Hardin, LA Audubon Ballona Wetlands Education Program Coordinator, and Jane Beseda, Director at Large, Santa Monica Bay Audubon Society. With plentiful resources, the Tongva were able to establish a community of more permanence than those usually found in hunter-gatherer societies. They also had a very effective and far-reaching trading network that enhanced their comfort level and provided social stability. In fact, abalone shells used for trade have been found as far east as the Mississippi. The Tongva’s great skill as boat builders helped to facilitate this trading. 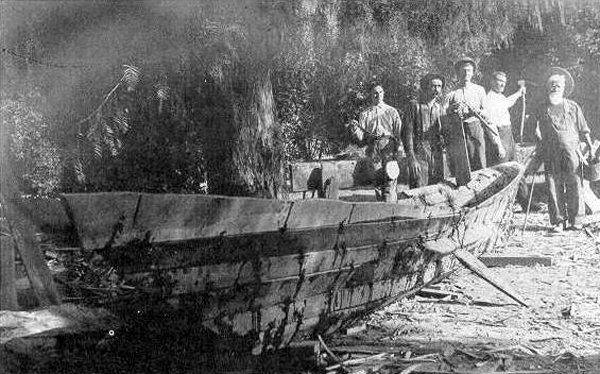 The Chumash and Tongva made large seaworthy boats, called tomols, out of planks instead of hollowed-out logs. They split pine into boards, steam-bent the boards in hot sand pits, and sanded them with sharkskin. A sticky mixture of asphaltum and pine pitch, called yop, was applied to the seams and joints in order to waterproof the vessels. They were then coated with ochre and pine pitch as further waterproofing. Canoe builders were the members of elite guilds, and highly respected within their societies. Replica of Tongva sewn-plank canoe, 1912. These incredibly seaworthy boats allowed the mainland Tongva to trade with the island-dwelling Tongva on Santa Catalina, San Clemente and San Nicolas. This was very important, as steatite, or soapstone, was quarried on Santa Catalina. Steatite can be heated directly over fire without breaking, and was carved into cooking bowls. Steatite chunks were also superheated and dropped into watertight baskets in order to bring liquids to a boil. Meat, seeds and acorns were traded for this important material. Specialized technologies facilitated better food gathering and cooking techniques. The Tongva were highly skilled at basketry, and made seed beaters, winnowing trays and mush boilers using local plant materials. They also fashioned digging sticks, which were weighted with stones carved into donut shapes, to hunt for roots and bulbs. The Tongva had a codified and complex leadership system. Each settlement had its own leaders, and several settlements would form a confederation overseen by a more powerful chief. The Tongva had strong spiritual traditions, and every settlement had a shaman, or holy man. They held intricate rituals on various occasions throughout the year. Modern Gabrielino woman representing Toypurina. Power was passed down along hereditary lines, but they would skip a generation if they thought the next heir in line was unsuitable for the job. Since the position of chief was based on blood lineage, chiefs could be either male or female. If a chief had no son or brother, elders could appoint his sister or eldest daughter, but not his wife as she was of a different lineage. Born in 1760, Toypurina was a powerful female spiritual leader, respected for her bravery and wisdom. She was considered a great communicator, speaking with and trading with dozens of villages. She opposed the rule of colonization by Spanish missionaries in California and, at age 23, led an unsuccessful rebellion against them. 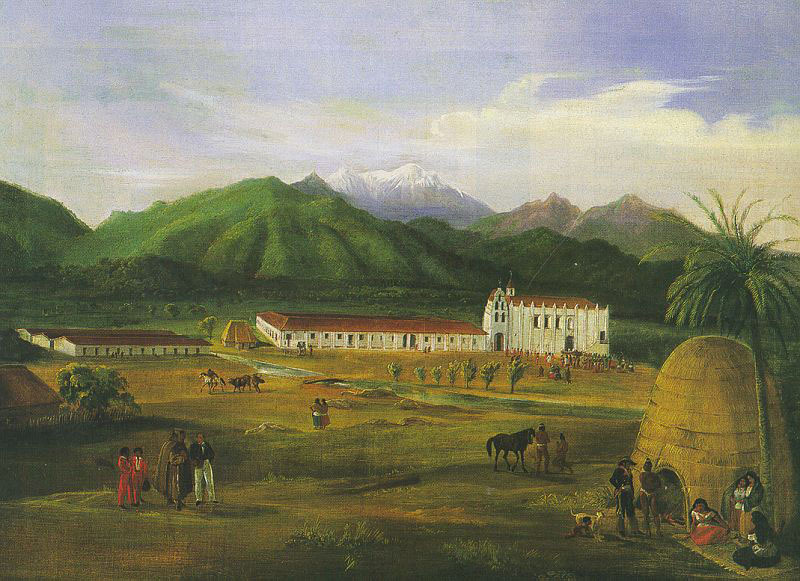 San Gabriel Mission circa 1810 with Tongva kiiy in foreground. The prosperity and success of the Tongva began its decline when increasing contact occurred with the western Europeans. In the winter of 1604-1605 the explorer Vizcaino sailed into Santa Monica Bay. He was followed by various exploratory parties, and then the Spanish monks. The Tongva were marched against their will to build a mission in San Gabriel. The Spanish gave them a new name: Gabrielinos, meaning the people of the San Gabriel Mission. Families were split up, and chiefs and leaders killed. European diseases to which the Tongva had no immunity further decimated the population. By the end of the 19th century, 250,000 people had been reduced to 9,000. There are still surviving members of the Tongva living among us. Some of them are hard at work preserving what remains of their culture, and educating others about the first inhabitants of the Los Angeles region. Critical to this effort is preservation of the Tongva language, which is part of the Uto-Aztecan family. To take part, you may want to order “Now You’re Speaking Our Language,” a phrasebook of words and sentences by Julia Bogany. You can also visit Tovemur Rock in Palos Verdes, where the “first Singer and Dancer” of the Tongva Nation was turned to stone. You might want to say a prayer or sing a song or just enjoy the gorgeous area. The Tongva are also pursuing the goal of achieving Federal recognition as a tribe. Anthropologist Alice Mirlesse of Claremont McKenna College recently published “Identity on Trial: the Gabrielino Tongva Quest for Federal Recognition,” written to enrich the scarce body of literature about the Tongva, and to reach both policymakers and a general audience. The state of California and the cities of Los Angeles and San Gabriel already recognize the Tongva as a tribe. 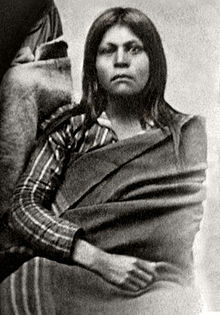 Believed to be Juana Maria, the Lone Woman of San Nicolas Island. About The Island of the Blue Dolphins by Scott O’Dell: This very popular book about “the lone woman of San Nicolas Island” is often included in the State of California’s fourth grade curriculum. It contains much information about how this woman, known as Juana Maria, lived alone on San Nicolas from 1835 until her discovery in 1853, including how she fashioned a cormorant-feather cape for herself. However, the book is not historically accurate. 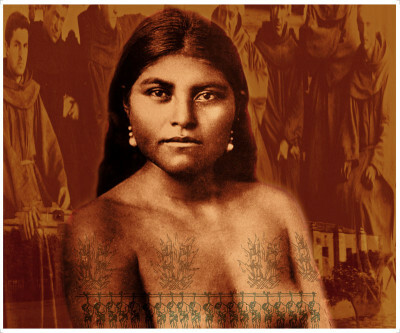 Upon her “rescue” from the island, she was taken to Santa Barbara, where she could not communicate with the Hokun speaking Chumash of that area, or with those who spoke the Tongva language. Upon her arrival in Santa Barbara she consumed large quantities of fruit and unfamiliar foods and perished within seven weeks. Ballona Wetlands, while much of the reserve is currently closed to the public, Friends of Ballona Wetlands and other community partners offer many tours, restoration events, and more. 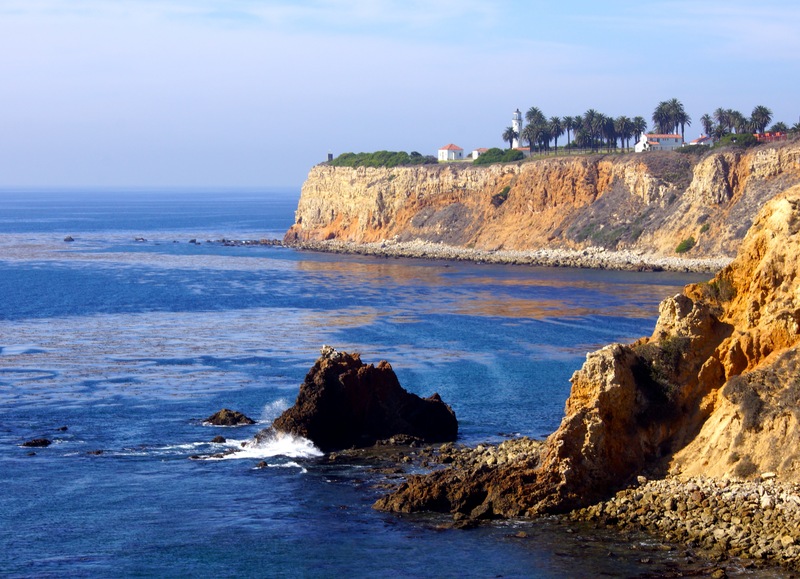 Tovemur Rock, can be viewed from Pelican Cove Park, 31300 Palos Verdes Drive South, Rancho Palos Verdes. Satwiwa Native American Indian Culture Center, hosts Native American workshops and programs throughout the year. Rolling grasslands, oak woodlands, and chaparral can all be seen on the same hike. Newbury Park, Santa Monica Mountains National Recreation Area. Kuruvungna Springs Cultural Center & Museum, at University High School, West Los Angeles. Heritage Park Tongva Exhibit, Santa Fe Springs. Discovery Park, museum without walls, Playa Vista. The Rancho Los Alamitos, once the sacred Tongva village of Povuu’ngna, Long Beach. Louis Robidoux Nature Center, home to an authentic Tongva site housing genuine artifacts, such as a worksite for women and slicks and mortar, Riverside. Tongva Memorial, at Loyola Marymount University, a place to learn more about the first Angelenos and some of the plants they used, Westchester. Tongva Native Garden, at Pitzer College, containing 23 plants that are the most significant for the tribe in the coastal sage scrub ecosystem, Claremont. El Dorado Nature Center native garden, Long Beach. Los Angeles County Arboretum and Botanic Garden, field trips include discussion of use of plants by Tongva/Gabrielino natives, culture of native Californians, and plant and cultural introductions by the Spanish, Arcadia. *Santa Barbara Museum of Natural History-Chumash Section, home to a life-sized reproduction of a Chumash boat, which shares the same technology as boats built by the Tongva, Santa Barbara. *Bowers Museum, First Californians Exhibit, with great examples of Tongva basketry and other artifacts, Santa Ana. The Southwest Museum, Highlights of the Southwest Museum of the American Indian Collection, In the Mt. Washington area of Los Angeles. *Los Angeles County Natural History Museum, this extensive museum includes many exhibits that touch on Tongva history, including Becoming Los Angeles Exhibit, La Brea Tar Pit Excavations Exhibit, Lando Hall of California History Exhibit. Exposition Park, Los Angeles. On the Museum’s website, search on keywords Native Americans for a list of current exhibits. The main Native American section is tucked in the back on the west end of the first floor. * Alcala, Martin, “The Gabrielino/Tongva Indians of California Tribal History” (pre-2008). * Altshcul, Jeffrey H. and Grenda, Donn R., Islanders and Mainlanders: Pre-historic Context to the Southern California Bight (2002), SRI Press, Tucson, Arizona. Azusa, City of, website, Tongva Pathfinder section in Online Resources and Book Resources. Bogany, Julia et al., “Now You’re Speaking Our Language,” (2012), Pamela Munro and the Gabrielino/Tongva Language Committee. A phrasebook of words and sentences in the Gabrielino/Tongva/Fernandeno language of the Los Angeles Basin. Available at Lulu.com. *Bowers Museum of Cultural Art, Southern California Indian Curriculum Guide (2002), 2002 N Main St., Santa Ana, CA. * Eagle Rock-Highland Park 4-H Club, “Mixed Nuts: Tongva Use of Southern California Mixed Oak/Black Walnut Woodland” (1997), Southwest Museum, Los Angeles, CA. Gray-Kanatiiosh, Barbara A., Gabrielino, (2004), ABDO Publishing Co. Preview this children’s book in the eBook version, or order new or used copies at multiple sites on the internet. * Los Angeles County Museum of Natural History, Tongva Section and various exhibits, 900 Exposition Blvd., Los Angeles, CA. Los Angeles Indymedia: Activist News website, Tongva: Our Voice, Our History, Our People, featuring highlights of an exhibit held in November 2008, in Aleupkingna (Arcadia). Includes photos of rock paintings and reproductions of female attire and shoes. Loyola Marymount University, Hannon Library, Online Gabrielino Indians Publications Collections and Art and Documentaries, 1 Loyola Marymount University Dr., Los Angeles, CA. Mirlesse, Alice, “Identity on Trial: the Gabrielino Tongva Quest for Federal Recognition” (2013). Pomona Senior Thesis. Paper 90. National Park Service website, Channel Islands Section, California Islands Symposium 2012, “The Lone Woman of San Nicolas Island” presentations. * Thomson, Mary Leighton, “The Gabrielinos.” (1993), Playa del Rey, CA. Historical booklet now out of print, carried by the Loyola Marymount University Library, or online courtesy of Gail Yeaple at adprose.org. Welch, Rosanne, “A Brief History of the Tongva Tribe: the Native Inhabitants of the Lands of the Puente Hills Preserve” (2006), PhD Program, Department of History Claremont Graduate University, Claremont, CA. Thank you for fascinating series. I’m glad to know more about original inhabitants and how they lived.